Excuse me protojeb21. But are you suggesting you found the first extrasolar dwarf planets? How small are these anyway? Second, on what type of tool (planet hunters, EE, ect) did you use? And give it to a person who would like to recolor it, add some stuff and draw the abject it is orbiting! It will help us finish the project in a short time! Send me a message "#TicketToSpace"
And you will get a few pictures from me! +instructions! Added Neptune, Uranus, Saturn and Jupiter. The first one was found by Vidar using Everest 2 data and LcViewer. When he reported it, I decided to have a closer look as there seemed to be extra objects in the system. My analysis revealed two new candidates, one slightly larger and one slightly smaller than the first. I will reveal the radii and other parameters for the system when I do my full report on it. Hope some of these look good to you and Vidar! I just noticed something. It seems that this may be an EB. After a visual look in DECaLS/DR3(Look at it Here) it clearly shows two objects. maybe a very distant brown dwarf(Its not shining). That would make this an odd system. Also do note that the second object visible does not put out really any optical light compared to the star, but puts out the same infrared light. 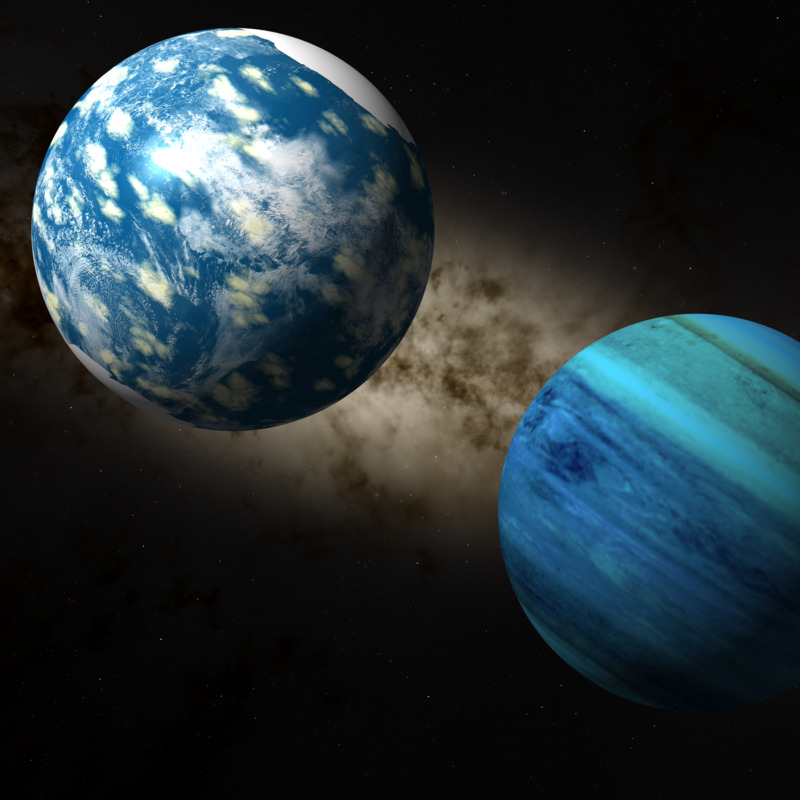 The blue gas giant is Kyche and the water world is called Aquatus. Believe it or not, that was my first drawing. If i will say that i am impressed, i would lie, because i am FRICKING ASTOUNDED! And some goooood art right there. Art program? Okay. One more question. Did you create all the textures (land, clouds, ect) yourself, or did you take them from another program? The clouds on Aquarius were taken from KSS Kyche was used from my own mod but I made the aquatus texture myself. Also using gimp. i am still working on making my own cloud textures. Yes, we gonna do some stuff we don't usually do, get on with that. Might be able to do a view of a planet, around a star, being destroyed by a black hole. Sound good? Also, I'm almost done with the solar system banner, just need to do Pluto and the hypothetical Planet 9 and 10 (interestingly, 10 is closer). I once did Gargantua from afar, I could do a closer, more realistic view sometime with a Doppler-shifted accretion disk.